We tried making bricks using matchboxes but the bricks broke. The container was not too strong. So we got a bigger container – it was rectangular and made of plastic. 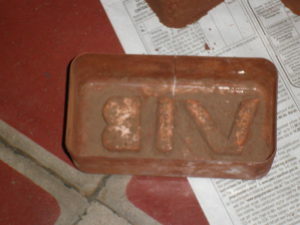 We took thermocol and we cut it in the shape of “V”, “I”, “B”. The meaning of VIB is “Very Important Bricks”. We stuck the thermocol in the plastic container with glue. Then we dried it for one day. We dug red mud from outside the school. We put it in a bucket and we filled the bucket with a little bit of water. And we mixed it with our hands and spades. And we took the bucket to the terrace. First we put newspaper on the floor of the terrace. Then we took plain sand and we put it in the container and then we poured it out so that the container would not be sticky. We took a little mud out of the bucket and we kneaded the mud to make it strong. We made it a oval shape and we put it in the container. We smoothened it into the shape of the container. On top of the brick we put white sand so it would come out nicely without breaking. We turned the container upside down and we took a spade and hit on top of the container and the brick came out slowly. We made 18 bricks but 2 broke. We dried the bricks for one week on the terrace. Then we took the bricks into our art room and after one week we used them to make a room. 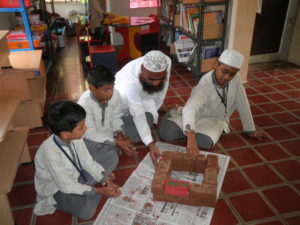 As we completed the year I thought I would enclose some photos of the activity the kids seemed to love most – Brick Making! (Small Science TextBook, Class 3 – Chap 12 “Make Your Own House”). They used a plastic box as a mould, stuck letters made of styrofoam at the bottom of the mould and made bricks from mud around the school! They dried the bricks for a week in the sun and then inside for another week. Today they started trying to make a small room with the bricks and learned about layering them. Thanks for this great activity.